I've had egg rolls wrappers sitting in my fridge for a few days and didn't really know what to do with them other than my usual vegetable egg rolls (wow... looks like I had a white balance issue back then!) As I was baking some chicken breasts and rice, I thought it would be good to make a burrito. Then I remembered the egg rolls and HELLO great idea! Chicken burrito egg rolls! 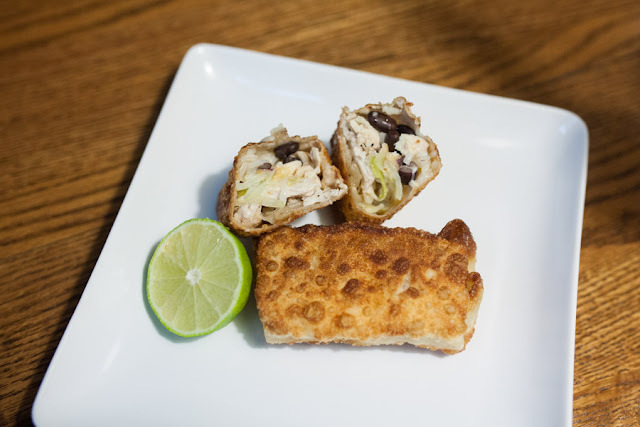 I just put the usual burrito ingredients inside the egg roll wrapper - chicken, black beans, rice and cheese. I added shredded cabbage (aka cole slaw mix) for crunch and really liked the texture it gave. Just pan fry these for a few minutes on each side until they are golden brown and crispy. I added a little lime juice, fresh cilantro, salt and pepper to the rice to give it more flavor. I wasn't trying to copy Chipotle's cilantro lime rice... because let's not talk about how many times I've tried to recreate that and failed. I'm convinced they put crack in it. You're left with this totally yummy treat and a filling dinner. 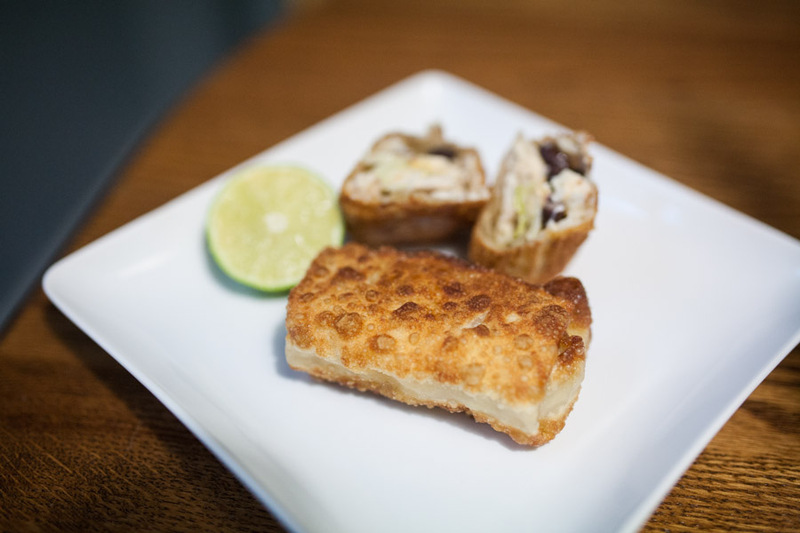 It would be fun to make a dipping sauce from sour cream, lime juice and maybe a little honey. If you try it let me know! 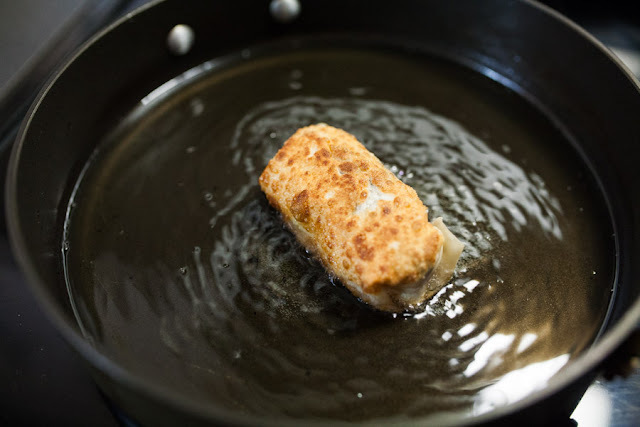 Heat oil (you want about 1/2 inch depth of oil in the pan) in a large skillet over medium heat until it reaches about 350 degrees. You want bubbles to form when you put the egg roll in the hot oil, but not bubble up too quickly and burn. Mix the cooked rice, lime juice, cilantro, salt and pepper together in a small bowl. Taste to make sure it is seasoned correctly and has good flavor. Lay one wrapper down in front of you. 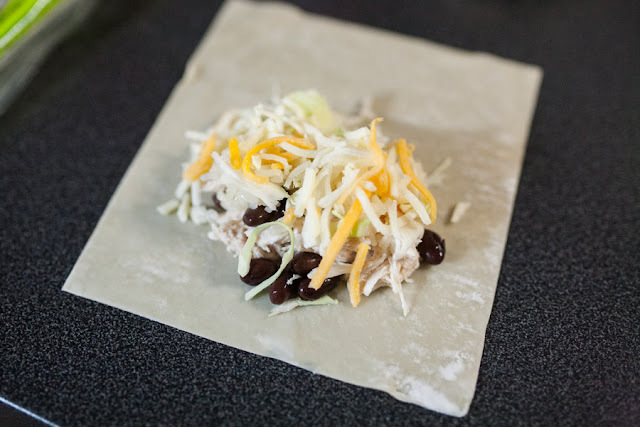 Put about 1 tablespoon shredded chicken, 1 tablespoon black beans, 2 tablespoons rice, 1 tablespoon shredded cheese and a little shredded cabbage (you can just estimate all this.) You want the wrapper to be full, but not too full. You can reference my photo above. Fold the bottom up over the fillings, then fold in the sides and roll it up like a burrito. Set aside as you make the rest. 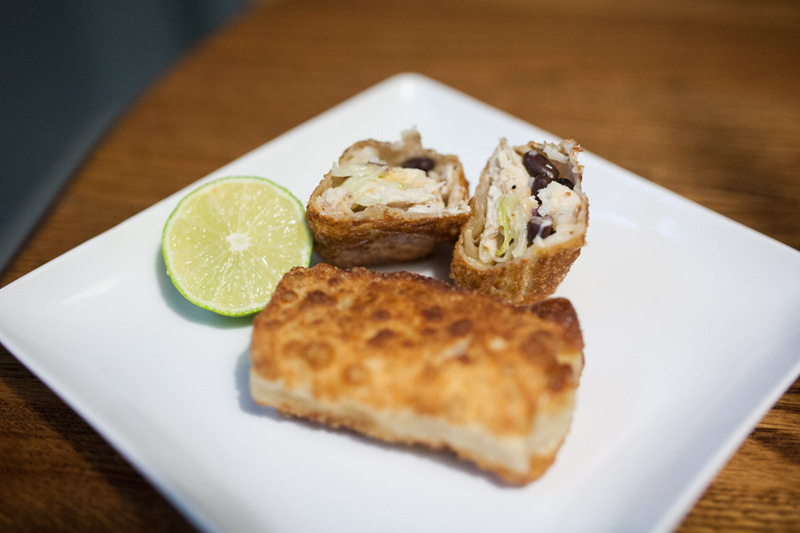 Once all your egg roll burritos are made, put them in the oil for a few minutes on each side until they're golden brown and crispy. Let them dry on paper towels, then enjoy! Yum! This would be a perfect lunch recipe! Excellent dish idea, Jenna!